Seems like this holiday is having diner at home time. 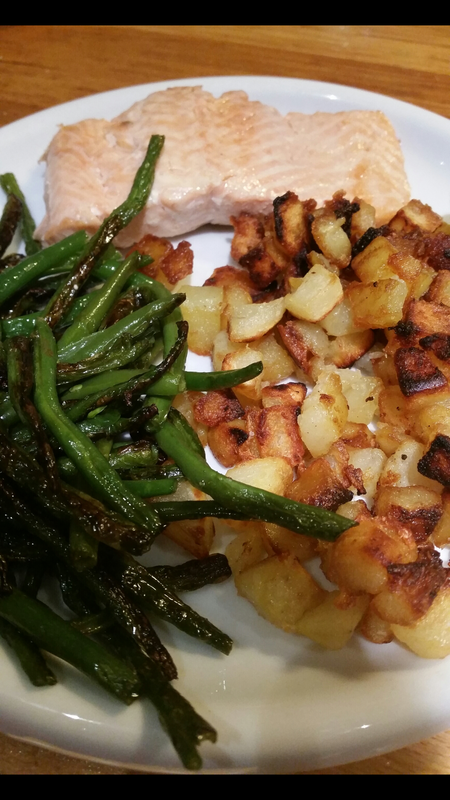 I baked some salmon and grilled some green beans and cube potatoes. Salmon is amazing in terms of benefits it brings to your body. It’s great in omega-3, it controls digestive inflammation, and helps stabilise the collagen and minerals in the bones and surrounding tissues. As well as being a great source of minerals, it boosts brain function and can help you sleep better. Green beans reduces the risk of heart disease and improves the regulation of diabetes. It is a good booster for the immune system. Green beans are quite low in calories and are great and easy to add to any meal. Potatoes in every form, but especially baked with the skin on, are know to help maintain blood pressure due to their high level of potassium. Potatoes are also high in vitamin B6 which is essential for many enzymic reactions such as creating red blood cells.